Structural model showing a covalent organic framework (COF) embedded with a cobalt porphyrin. A molecular system that holds great promise for the capture and storage of carbon dioxide has been modified so that it now also holds great promise as a catalyst for converting captured carbon dioxide into valuable chemical products. Researchers with the U.S. Department of Energy (DOE)’s Lawrence Berkeley National Laboratory (Berkeley Lab) have incorporated molecules of carbon dioxide reduction catalysts into the sponge-like crystals of covalent organic frameworks (COFs). This creates a molecular system that not only absorbs carbon dioxide, but also selectively reduces it to carbon monoxide, which serves as a primary building block for a wide range of chemical products including fuels, pharmaceuticals and plastics. 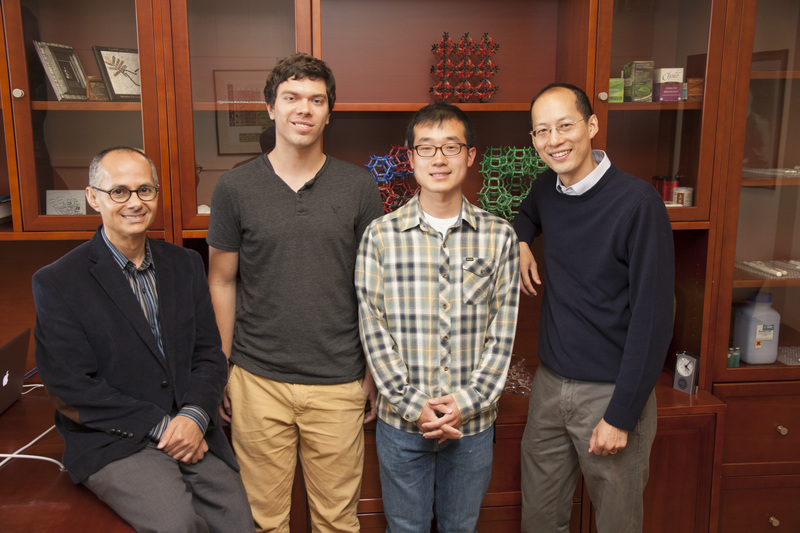 Chang and Omar Yaghi, a chemist with Berkeley Lab’s Materials Sciences Division who invented COFs, are the corresponding authors of a paper in Science that describes this research in detail. 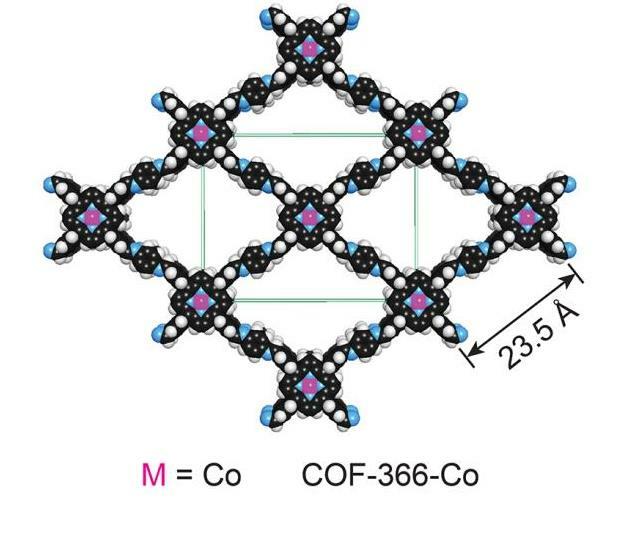 The paper is titled “Covalent organic frameworks comprising cobalt porphyrins for catalytic CO2 reduction in water.” Lead authors are Song Lin, Christian Diercks and Yue-Biao Zhang. Other co-authors are Nikolay Kornienko, Eva Nichols, Yingbo Zhao, Aubrey Paris, Dohyung Kim and Peidong Yang. The notoriety of carbon dioxide for its impact on the atmosphere and global climate change has overshadowed its value as an abundant, renewable, nontoxic and nonflammable source of carbon for the manufacturing of widely used chemical products. With the reduction of atmospheric carbon dioxide emissions in mind, Yaghi and his research group at the University of Michigan in 2005 designed and developed the first COFs as a means of separating carbon dioxide from flue gases. A COF is a porous three-dimensional crystal consisting of a tightly folded, compact framework that features an extraordinarily large internal surface area – a COF the size of a sugar cube were it to be opened and unfolded would blanket a football field. 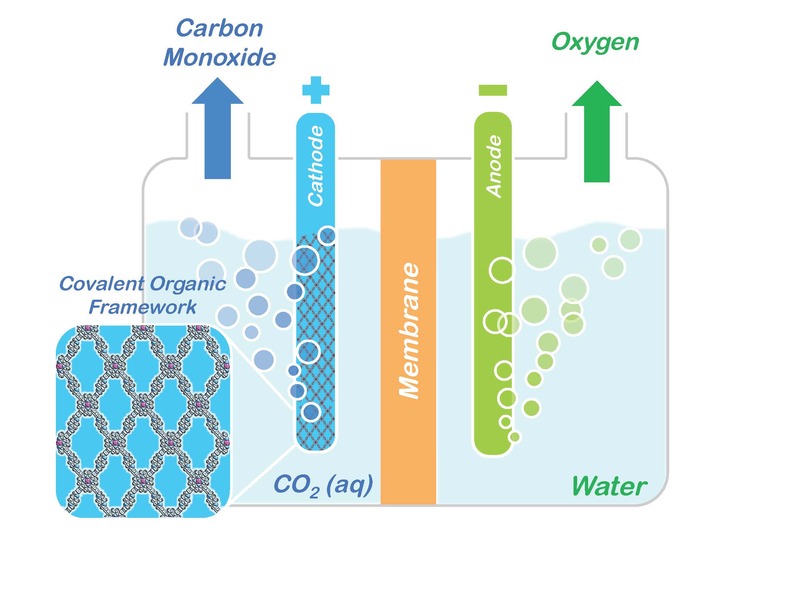 The sponge-like quality of a COF’s vast internal surface area enables the system to absorb and store enormous quantities of targeted molecules, such as carbon dioxide. Now, through another technique developed by Yaghi, called “reticular chemistry,” which enables molecular systems to be “stitched” into netlike structures that are held together by strong chemical bonds, the Berkeley Lab researchers were able to embed the molecular backbone of COFs with a porphyrin catalyst, a ring-shaped organic molecule with a cobalt atom at its core. Porphyrins are electrical conductors that are especially proficient at transporting electrons to carbon dioxide. In performance tests, the porphyrin COFs displayed exceptionally high catalytic activity – a turnover number up to 290,000, meaning one porphyrin COF can reduce 290,000 molecules of carbon dioxide to carbon monoxide every second. This represents a 60-fold increase over the catalytic activity of molecular cobalt porphyrin catalyst and places porphyrin COFs among the fastest and most efficient catalysts of all known carbon dioxide reduction agents. Furthermore, the research team believes there’s plenty of room for further improving porphyrin COF performances. This research was supported by the DOE Office of Science in part through its Energy Frontier Research Center (EFRC) program. The porphyrin COFs were characterized through X-ray absorption measurements performed at Berkeley Lab’s Advanced Light Source, a DOE Office of Science User Facility.